Today, I got to see some of Israel. I’m staying with the IAJGS conference co-chair, so I do a bit of helping out with the conference. I have already been helping out with a few things, but now I’m sometimes helping with random jobs that need doing. I spent some of the morning doing that. Then I headed to the Old City of Jerusalem. Another friend, Barbara, has been here for about a month taking Hebrew lessons, so I met her at the Jaffa Gate and we went for a walk. We took pictures, did a little shopping, stopped for lunch, and walked on to the Western Wall. She has been here for a while, so she sat in the shade while I visited the Wall and took a slew of pictures. We then went to the nearby Davidson Museum, an archaelogical museum. We watched the video in Hebrew and English. The only ones in the room, we joked around quite a bit. Then we walked around the area to see what was found there. It doesn’t sound like much when I write it here, but we took our time walking around and just enjoyed ourselves. Sometimes I might want to see so much that I’ll run around like crazy, but most of the time, I’d rather take my time and enjoy what I’m doing, which we did. Michael was surprised by how early I got back, but it felt like a pretty good day. And I know I’ll go back, probably a few times, in the coming weeks. I then had a quick car tour from Michael of the areas nearby his home and we went to dinner. The app really doesn’t want to cooperate, but I think I’ve improved the method for getting a photo online over the previous post. 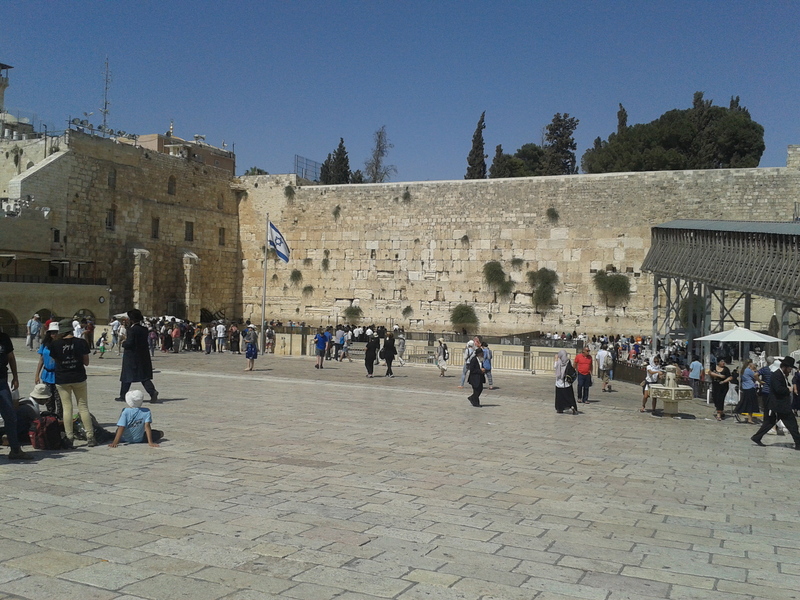 So today, I will leave you with the Western Wall, the Israeli flag flying in front of it.